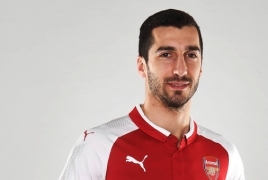 PanARMENIAN.Net - Armenian midfielder Henrikh Mkhitaryan is gearing up for Arsenal's Premiere League clash against Watford. "It’s Matchday. Let’s go #Gunners," Mkhitaryan said in a Facebook post on Monday, April 15. Mkhitaryan was poor against Everton last Sunday, but with Napoli away on Thursday he may start in order to give ​Mesut Ozil and Aaron Ramsey a rest. He has played well in bursts this season but needs to bring more consistency to his game.